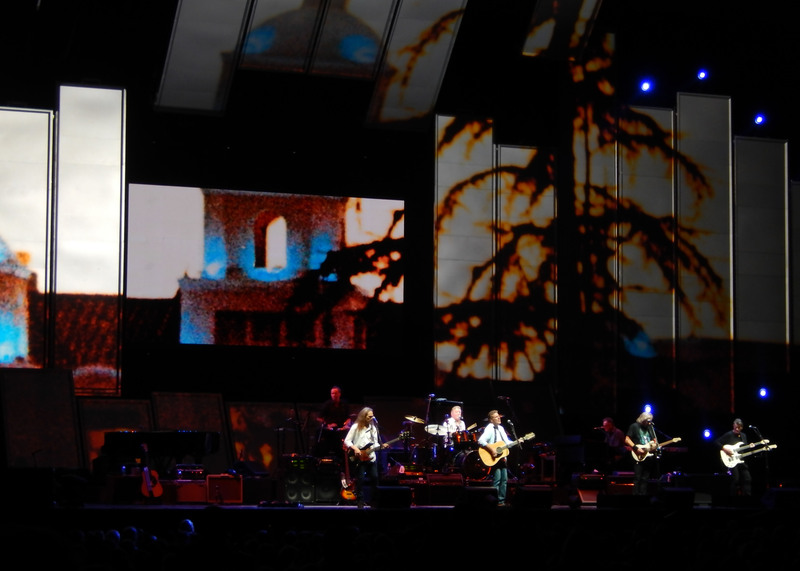 The Eagles at the Tacoma Dome last night was a great show. We saw this show (History of the Eagles) when they started back in March at the Verizon center in Washington DC and this show was as good as I remember from then. They put on an awesome show, especially this tour which was a historical walk through their musical compendium from the early 1970’s through The Long Run and into their When Hell Freezes Over reunion when they got back together after being apart for 14 years. It was interesting to get the narrative from Glenn Frye and Don Henley on the forming of the band (and when the other member joined), the creative methods for a lot of their early hits and just how they worked together for the last 40+ years to create this great music. They played a great retrospective of Eagles music and even included some great songs from Joe Walsh such as In the City and Life’s Been Good. They even played an old James Gang cover Funk #49. In my opinion, some of the highlight songs from last night were; Lyin’ Eyes, Tequila Sunrise, Peaceful Easy Feeling and a cool, funky version of Witchy Woman. Of course my favorite song was Hotel California which was their first encore. It was cool to see Don Felder perform this song Sunday night and then the Eagles perform it Monday. I almost expected them to get together during this show and perform together…but I guess that will (can’t) ever happen. All in all (and aside from the picture restrictions, obligatory drunks and seat cheaters) the music made this an incredible show that I am really glad I was able to see.